LOS ANGELES, September 25, 2018 – Award-winning actress and author, Kimberly J. 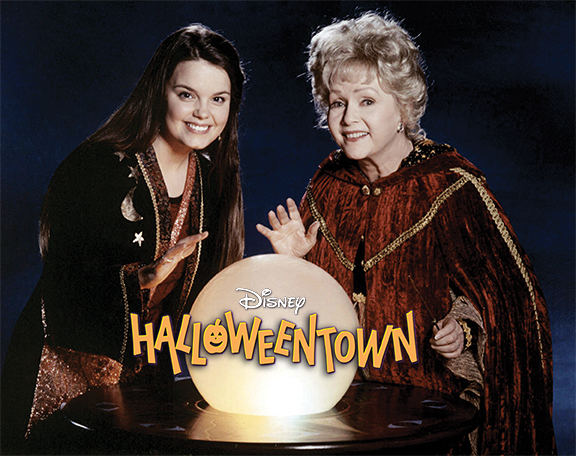 Brown, popularly known as the beloved magical witch “Marnie,” star of Disney fan fave “Halloweentown,” announces 20th Anniversary celebration with events sure to delight Halloween lovers everywhere, featuring special in-person and online tricks and treats for fans to join in the fun. With events scheduled throughout the fall, Brown kicked off the celebration at a sold-out Midsummer Scream event held at the Long Beach Convention Center, honoring a generation of fans who have grown up on the perennial Halloween staple. She is set to appear at the upcoming Disney Villain's Buckle-Down product launch at the Perky Nerd in Burbank on Sept. 27 from 6:30-8pm for photos and to sign her fall children's book: Poppin's Pumpkin Patch Parade. Then it's off to Halloweentown for real! That's right. Halloweentown is a real place that fans can visit. This year, the cast will reunite at the original film location in St. Helens, Oregon on Oct. 13, where they will lead the annual pumpkin lighting in the Town Square with thousands of devoted fans. The City honors Halloweentown every year with fans traveling from all over the world to join in a host of activities, including photo ops, autographs, raffles & more. So popular is the film franchise, it's become classic seasonal viewing much like “It's a Wonderful Life” at the holidays, where fans costume as their favorite character and host movie marathons. College campuses and Disney fan clubs sponsor annual “Halloweentown” viewing parties inviting its Emmy-nominated star, who is often asked to do speaking engagements about her career in the Entertainment Business, that also includes a remarkable range of roles in films, TV, Broadway, Soaps, Voice-overs, & Animation, including voicing “Silly Rabbit Trix are for Kids!” Shhhh….One lucky campus is set for a surprise visit from “Marnie” for a post-movie Q & A, with photo ops and more. Comic Con & cosplay fans will be delighted to know they can join “Marnie” with original costume at upcoming Wizard World events. And for the coveted Halloween weekend, Brown will appear at the Los Angeles Comic Con with anniversary surprises planned for guests including autographs, photo ops, t-shirts, raffle prizes and more. For online fans, a chance to win prizes and giveaways, including autographed DVD's, and a special “Marnie” Halloween phone call are also on the agenda. For more information, visit www.KimberlyJBrown.com. Follow “Marnie” @OfficialKJB and @PoppinsPumpkins on social media; #Halloweentown20 – For appearances, book readings, etc. email [email protected], or call (323) 963-8594.